1. If you want to order C2C row-by-row counts for more than 1 (one) graph, please contact us beforehand, and we will create a custom listing for you to cover the entire order. This product is only available for those who already purchased a graph that doesn't have written C2C (corner to corner) row-by-row counts included. By purchasing this, you're requesting the delivery of C2C row-by-row counts for a specific graph. Please make sure you contact us before, during or immediately after the purchase to specify which is the graph you want the C2C row-by-row counts for. This product doesn't come with an image graph and is ONLY AVAILABLE as an ADD-ON for those who ALREADY PURCHASED the graph they want the C2C row-by-row counts for. Proof of graph purchase may be requested. 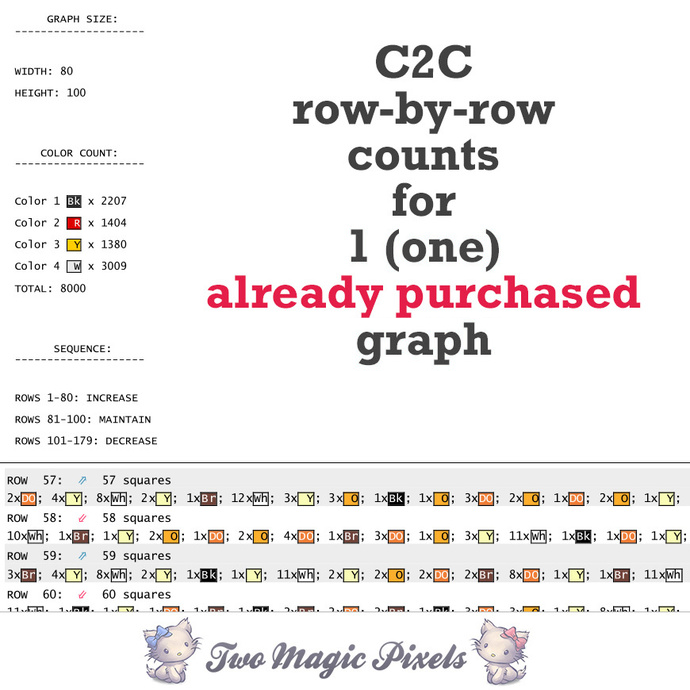 Please have a look at the sample image to check which information is included with the written C2C row-by-row counts. When you purchase this product you will be able to download a SAMPLE PDF. The actual C2C row-by-row counts file will be sent to you manually by e-mail. The e-mail will be sent to your PayPal e-mail address, unless you specify otherwise. Delivery time is between 1 and 3 working days, depending on availability.